Limited edition motocross boot now available across Australia. 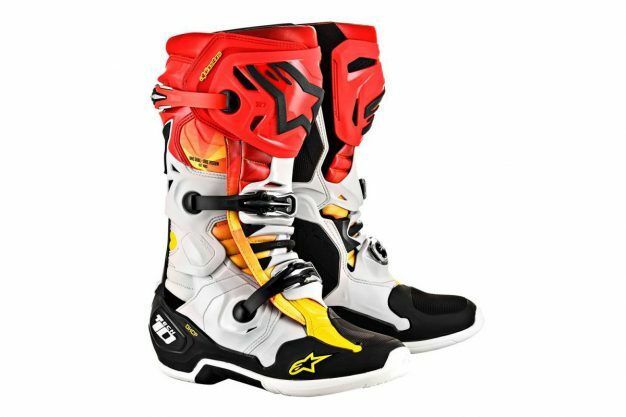 Alpinestars has released Limited Edition Indianapolis Tech 10 boot in conjunction with last weekend’s 11th round of the Monster Energy AMA Supercross Championship in the home of US racing. Inspired by the flame detailing of classic American hot rods, the boot features a distinctive black, metallic red and yellow red color scheme. The CE certified Tech 10 is a technologically advanced and protective boot that incorporates innovative materials in a streamlined design for a lighter, more anatomically profiled performance. 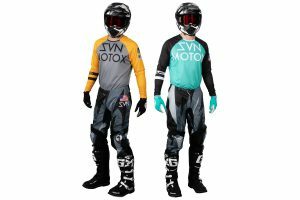 The ‘Indianapolis’ blends all of the technological properties of the Tech 10 in a striking colourway, as worn by all of the Eli Tomac, Marvin Musquin, Cooper Webb, Justin Barcia and all of the Alpinestars riders at the event, allowing supercross fans to wear the same boots as their racing heroes. – Exclusive dual compound sole is seamlessly integrated to the multi-density foot base structure with built-in support. The sole offers superior durability, grip and feel while riding. – The central sole insert is easily replaceable and Alpinestars offers a full sole replacement and boot repair service. – New buckle closure system includes high-impact aluminum bridge closures, with memory and a quick release/locking system with self-aligning design for easy, precise closure and improved riding performance and security. All buckles are easily replaceable. – Soft microfiber gaiter helps seal out excessive water and dirt entry. – Poly-fabric lining with 3D open cell foam incorporates anti-slip suede on heel area to keep foot located inside the boot. – Frontal protection features a dual closure system with an internal microfiber flap, plus velcro for a precise fit closure attached securely with a micro-adjustable, easy to operate, lightweight buckle. Shin incorporates a unique TPU blade system engineered to prevent frontal hyperextension and offer greater flex control. – Contoured TPU calf protector plate offers impact resistance and incorporates Alpinestars’ innovative rear blade system, formed with hard shock resistant polymer to protect the heel and features a rear hyperextension guard. – Innovative, ergonomic design for lateral and medial flex zones to provide superb front and rear flexion support which helps prevent damaging torsional forces around the ankle area. – Multi-density foot shell incorporating heel and toe protection is highly resistant to abrasion and impact, and adds to the boot’s overall durability. – Innovative biomechanical inner ankle brace features medial and lateral ‘C’ torsion bars to control ankle and leg rotation, while allowing freedom of movement. Wide fit torsion bar replacements are included. These dual connection torsion bars offer the rider natural ankle movement with progressive damping of torsional forces during an accident. – TPU protection and shock absorbing padding on the heel and ankles and an ultra thin and flexible forefoot area for increased sensitivity and control. – New, dual compound, removable anatomic foot-bed includes EVA for comfort and support and aids even weight distribution. Priced at RRP $699.95, the Alpinestars LE Indianapolis Tech 10 boot is available to purchase from participating dealers and online retailers. 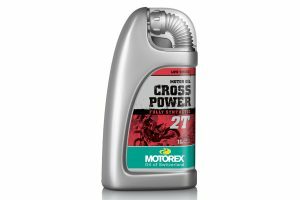 For more information, visit www.alpinestarsmx.com.au.